Engineer Gareth Jones says Depeche Mode used an E-Mu Emulator II on People are Peopl "That song was a lot about sampling and the room," says Gareth Jones. "The monophonic Synclavier was a big part of the sound — we didn't have the polyphonic sampler until the fifth album [1986's Black Celebration] — and we also had an Emulator II and my own AMS. These were used all the time, and since only the Synclavier stored samples, a lot of what we did was recorded onto tape; track by track. The credo on Todd Rundgren`s current tour, according to an entourage member, is: ''You can`t get on the bus unless you sing.'' There are, however, exceptions. ''Well, we`ve got two stage guys who don`t have to sing,'' Rundgren said from his Cleveland hotel room. ''And the bus driver, I haven`t auditioned him yet. But if he can sing. . . .'' Singing is such a big deal because Rundgren and his group of 11 vocalists are out supporting his latest album, ''A Cappella.'' It`s pretty much what the title indicates: an all-vocal record, with Rundgren doing all the singing and using an Emulator, a computerized keyboard instrument, to synthesize his voice into the sounds of various instruments. The E-Mu Emulator II can be seen in this Instagram post, along with many of Jack's Snapchat stories. "Then, I have a massive collection of samplers going back to one of the very first ones that came out, which was the Mirage. I'm working now on a movie with Peter Jackson—I can't tell anything about the movie at this point—but I'm using a lot of these older samplers because they give me a lot of quality. I'm using the ASR-10, Ensoniq, the Mirage. I'm using the Emulator II. It's all really good for that stuff." 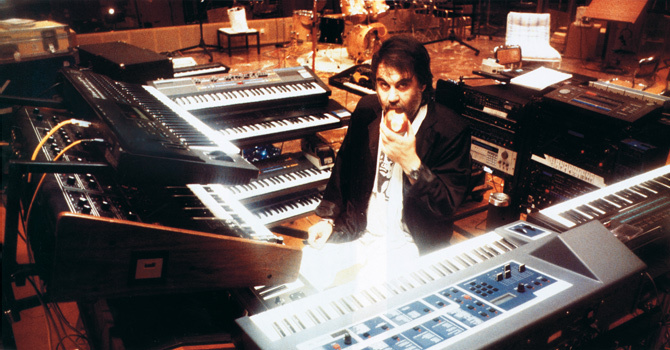 "I got the EII a day or two before we started work on the third Asia album and it didn't have a sequencer on it at the time, and the MIDI hadn't come through on either the Fairlight or the Synclavier (which I was on the point of buying), so the Synthex's MIDI sequencer was really useful for sequencing the EII." As mentioned in this forum, Doughty used it for the electronic sax solo on "Variety Tonight" from REO Speedwagon's 1987 album Life as We Know It. "Getting back to my live keyboard set-up, I also use an Emulator II, DX7, Jupiter 8 and a Korg CX-3. I do all my own keyboard mixing on stage and just send the PA a stereo mix of my sound because I like to keep control of what's going on. Effects-wise, I use a few digital reverbs and a couple of digital delays, that's all really. I don't use any MIDI facility on the road." The E-mu Emulator is clearly visible for the first 16 seconds of this video, where Stephen is playing it at the back of the room. Additionally, [this article](http://www.soundonsound.com/sos/mar05/articles/classictracks.htm) about the making of some of New Order's biggest hit singles lists the Emulator II among the synths used by the band in the studio. In this video, Andy Fletcher is playing an E-Mu Emulator II, seen clearly at 0:17. "This is an Emulator II. And it's an instrument that we use a lot in the studio and live. It's very versatile and very easy to use," Alan, at the beginning in this video. "Where we used keyboards as sampling devices, we'd sample a bit of guitar, say, and turn it 'round the other way, or sample a bit of noise and do something with it on the [E-mu] Emulator II, then just play it in a rhythmic fashion in the song." "The only new things were the Emulator II and the Linn 9000, though I didn't have time to get into the Linn properly before I started recording. Part of the catch with these things is that you do need time to get to know them. If the equipment arrives after you've started recording, you have to take it out of the studio to get to grips with it, which I didn't feel like doing in this instance." Here it is used by the band during the 13th Anniversary Show tour Oslo on October 5th, 1986. It can be seen starting 0:20 and more prominently 2:15. The sampler Harrison has chosen to stay with is the Emulator II with the Optical Media CD-ROM and CRM3 remote. (He also finds the Emulator's on-board sequencer incredibly easy to use, even though he does use Performer software on the Macintosh.) But he's not so struck on it that he isn't considering upgrading to the Mark III. 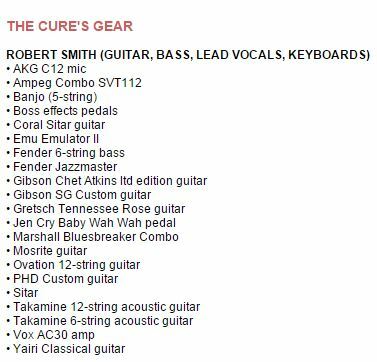 At the back of the album cover of the Rendez-vous album by Jean-Michel Jarre is a list of used instruments. In short: Seiko DS 250, Synthex, Moog, Roland JX 8P, ARP 2600, Fairlight, Emulator II, Eminent, AKS, Lynn 9000, Memory Moog, Drumulator, Laser Harp, RMI, Seiko DS 320, OBX, DX 100, Matrisequencer, TR 808, Prophet, Casio CZ 5000, Baby Korg personal keyboard. Chris Lowe is very clearly playing an Emulator II+ in this picture. Midge Ure plays an E-mu Emulator II during Ultravox's performance of "Vienna" at Live Aid (beginning at 2:50). "Combinations of the same sound also work very well - six synthesisers all playing the same thing can sound great. If you track a part you can never match the two parts perfectly. Something I did a while ago used an Emulator II cello preset which I tracked about five times, and it acquired a totally different character to the original patch. If you track a sequencer and alter the varispeed, the timecode will keep it in sync but the pitch will vary. You can do that as many times as you want and get massive sounds." (Tracks 1 and 2 were a mixture of the LM-1 (kick, detuned handclap, and pitched up LM-1 tambourine), the LinnDrum (snare #23, and the metallic clanky percussion was provided by the E-MU Emulator2. On stage, Mick uses an old Yamaha CP70 piano, converted to MIDI, as his master keyboard. Behind him is a Kurzweil with the Macintosh on top (the computer saves Mick's Kurzweil sounds — amazing, he says, that an £18,000 keyboard won't save your programs when you turn it off). Then there's an Emulator II, an Oberheim OB8, and a Roland JP8 which he uses MIDI'd together off the CP70 as his main 'block' of sound: the JP8 and OB8 panned around, and the Emulator padding out things with cellos and voices. He also uses the Emulator for one sequence in the current set, a cello intro on the re-arranged 'Book Of Brilliant Things'. On top of the CP70 at front is the inevitable Yamaha DX7. Not that Mick counts himself as a big FM expert — he uses the presets, like most users, and was put off any further exploration by early and complete confusion at FM's seeming illogicality. 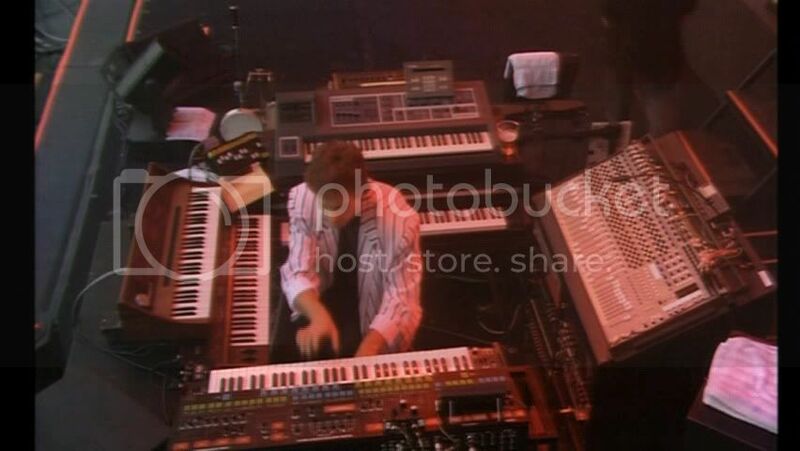 Martin can be seen playing an E-mu Emulator II sampling keyboard in this video, at 1:24. The instrument is credited in the cover album Enya - The Celts (1986 and remastered 1992). Enya : Vocals, Pianos, Juno 60, DX7, Emulator II and Kurtzweil. "We use our producer's Emulator II for long vocal samples and flying in choruses, although on Perfect Beat we felt that the quality wasn't quite good enough so we sampled some chorus and repeat vocals into an MDB Window Recorder and a Publison. Then we triggered them off the QX1, so you get some really neat triple repeats and things." "For instance, on the Melba Moore album I used the Yamaha RX11 drum machine with the individual outputs, which is MIDIable. I would write the song pattern on the RX11 and then MIDI it up to something else. I was MIDIing to an Emulator II which had samples on it which you could tune. It's basically using it instead of a Fairlight except you're not restricted to using Fairlight samples or Emulator samples. You could mix the RX11 sounds with the Emulator sounds, or you could trigger the DX7 with the RX11, or even an analogue synth via MIDI." "To me, 'Lovesong' had a real '60s feel," he explains. "So we used an [E-mu] Emulator II Vox organ sample from the [OMI] Universe Of Sounds CD. We ran it out into the studio through an amp to make it sound distorted, as if it was recorded in the '60s. And the organ sound on 'Untitled' is the harmonium sample from the same CD. At first we were going to use one of the church organ sounds, but that felt two pompous, too grand. The harmonium brings it down because it's a bit out of tune; it actually sounds as if it's being pumped with your feet. Somehow 'Untitled' creates an atmosphere of the Wild West." According to John Carpenter's website, an "Emulator II with OMI CD-ROM" was used on the soundtrack for "They Live." Yanni used the E-Mu Emulator II up until 1991 when it was replaced by the Emulator III. You can see it in this video at timecode 15:20. From there, it's on to nearby Lentil Studios to complete recording. It's there that he stores his Fairlight II, along with a PPG Wave 2.3, an Emulator II and a Prophet 5 - the last only for its ability to provide a guide click. The PWL complex is well-equipped, no doubt about it, with two out of three studios identically equipped with SSL desks, Sony 24-track digital machines, and generous amounts of outboard equipment. These are supported by the most comprehensive collection of keyboards this writer has ever witnessed in a studio: Fairlight III, Kurzweil, PPG Waveterm, Roland JX8P, Publison Infernal Machine (which Stock describes as "a Godsend"), Emulator II, DX7II, and so on. A lenda dos samplers! Digital mas com circuitos analógicos, trabalha de uma forma diferente os sons sampleados.